Under Section 39.3 of the Health Professions Act, the Inquiry Committee and Discipline Committee must direct Registrar to notify the public of certain complaint outcomes. 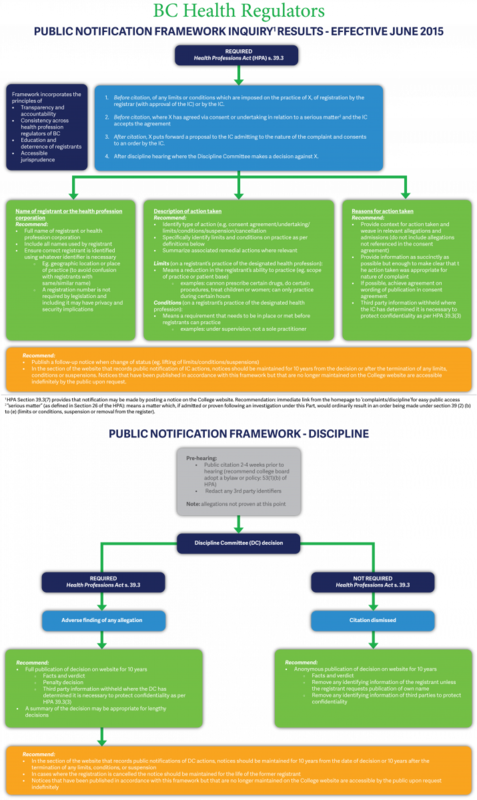 The BC Health Regulators developed a framework for public notification to help illustrate the publication notification requirements in the Health Professions Act. The Framework for Public Notification includes the process for publishing the details of inquiry and discipline proceeding and outlines what information is provided at each stage of a complaint. When the Inquiry Committee takes extraordinary action to protect the public during the investigation or pending a Discipline Committee hearing, the College notifies the public of the issue and any limits and conditions or suspensions imposed by the Inquiry Committee. Citations for a Discipline Committee hearing are published under Discipline Hearing Notifications on the College’s website 2-4 weeks prior to the hearing. When the Discipline Committee takes action in response to complaint under Section 39 (2) of the Health Professions Act, the College publishes the outcomes of the hearing under Complaints Outcomes on the College’s website.